Tobey Maguire is 40 years old, yet he stubbornly keeps looking like he's in his late 20s. The fact that he's blessed with extraordinary genetics is not his fault. It does, however, make the idea of the youthful-looking Maguire be a thoroughly convincing Bobby Fischer, genius chess player and all-around nut, a little hard to accept. Pawn Sacrifice focuses on Fischer's tormented genius leading to his match against Boris Spassky, where Fischer's brilliance and insanity were on full display for the world to see. Maguire in Pawn Sacrifice pushes himself as an actor, and it's an admirable, even strong performance. It's a pity though, that the film itself didn't push itself as much as Maguire (despite Maguire being a producer). Robert James Fischer, son of a Communist mother who enjoys the company of gentlemen callers, finds her son's chess fixation a bit of a bother. Bobby's obsession, however, will not be denied. Under the mentorship of Brooklyn chess master Carmine (Conrad Pla), Bobby (Maguire) grows in ability. Bobby also grows in arrogance, convinced that he is the greatest, he sets his eyes on the Russians. However, he is convinced that they form a great conspiracy to keep him rom winning, and he quits chess. He still wants in though, and into this enters Paul Marshall (Michael Stuhlbarg), a lawyer who sees Bobby as a way to knock the Ruskies out of something and show American supremacy. Paul asks Father Bill Lombardy (Peter Sarsgaard), a former chess prodigy who early in his chess playing managed to beat both Fischer and the Number One chess player Boris Spassky (Liev Schriber) to serve as Fischer's second. Despite his misgivings about Fischer's mental state, Father Lombardy agrees. Fischer if anything proves pretty much a strange mix of arrogance and fears. He insists on many sometimes unreasonable demands regarding money and long black cars, but he also insists that despite now being in the same state as his mother that she not come to the tournament so as to not prove distracting. He shows up to one match with literally only seconds to spare, but his opponent is never sure whether this was either to psych him out or because Fischer is positively bonkers. Fischer even for the longest time turns down a chance for a prostitute at his hotel, Donna (Evelyne Brochu), to remove his virginity for free to concentrate on his playing. He does eventually sleep with her, but even after he's deflowered he still keeps thinking about Spassky. Spassky, who is a mix of admiration and suspicion with regards to Fischer, defeats him, and Fischer is enraged, determined to pursue Spassky to a rematch. Fischer becomes more paranoid privately and publicly. He wears a paper bag over his head when arriving at an airport, and he insists on having his meals prepared in front of him to ensure poison isn't being slipped into his food. He also thinks the Soviets can send messages through people's dentures and says so publicly. Eventually, he has his rematch with Spassky, but Fischer's paranoia and excessive demands (playing in a rec room, insisting the cameras are too noisy) get him to lose Game One and forfeit Game Two. Spassky, convinced Fischer wants him to lose by winning without actually playing, becomes determined to 'beat him at his own game' and agrees to all of Fischer's demands. Soon, actual chess is being played, and while Fischer does beat the Number One Chess Champion, we learn that Fischer descends further into delusions and total disability. 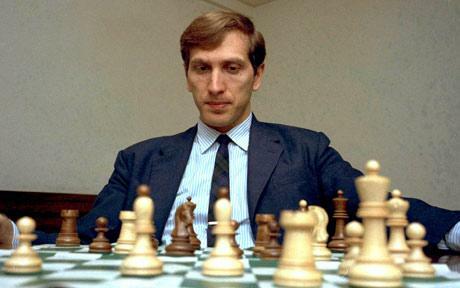 Bobby Fischer, more convinced than ever about a conspiracy against him by the Communists and the Jews (despite Fischer himself being Jewish), dying in 2008 in Iceland. I think this is Tobey Maguire's most accomplished performance, one where he gave it his all. He has a haunted look, that of a man who is paranoid and arrogant in similar turns. Sometimes one doesn't really know whether Fischer really was that delusional or whether in a certain way, he was playing at being one to get what he wanted. Fischer's competitiveness and his fears about being bugged all blend to make him either insane or cagey, or even a mixture. Maguire does as strong a job as possible to make this somewhat loathsome character someone more complex and interesting than perhaps he was. It's a pity that nearly everything else doesn't keep up with Maguire. My friend Fidel Gomez, Jr. (who is very much alive) detests Schriber, calling him 'wooden', playing all his parts in the same remote, stilted manner and worse, considering himself deep for his remote acting. For the longest time I defended Schriber, but in Pawn Sacrifice I concede the match to Fidel. Schriber is remote and almost a non-entity as Spassky. In what should have been a powerful performance, when Spassky thinks he sees through Fischer's bizarre acts to get him to win by default rather than by actual competition, you'd think Spassky would be either enraged or congratulatory to himself for deciphering Fischer's 'subterfuge'. However, Schriber plays it cold, emotionalless, not invested in outwitting his opponent. I'm going to walk back a bit of my previous statement. Both Sarsgaard and Stuhlbarg do good if not spectacular jobs as the more moral but still remote Lombardy and anxious but manipulative Marshall. However, I think it is Edward Zwick's direction and Steven Knight's screenplay that keep Pawn Sacrifice from being a really great film that it could have been. Why we aren't shown the match, this battle of wits between rivals, or why that rivalry is not emphasized or pushed further, is a wasted opportunity. Playing White Rabbit to show Fischer's growing paranoia is also a bad decision (a more clichéd song could not have been picked). We didn't need to get the intricacies of chess (not that many audience members would have followed them precisely), but knowing why the match was so great would have been good. Zwick decided to tell, not show, which was a terrible mistake. Another terrible mistake was in James Newton Howard's score. I've never been a fan of his, and Pawn Sacrifice hasn't converted me. 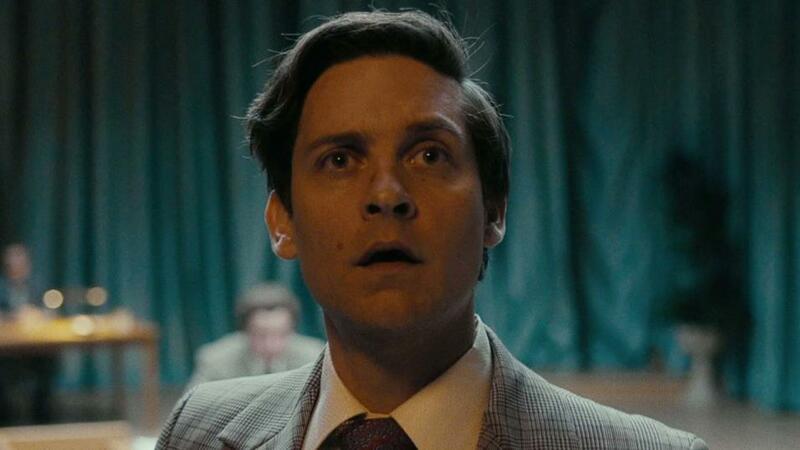 Ultimately, I think Pawn Sacrifice shows that Maguire really is determined to seek out better roles for himself. However, his stab at an Oscar nomination by way of two Academy standards (the biopic and the mentally ill role) will inevitably get lost in the shuffle and jockeying of other biopics (Brits in drag! Brits as country/western icons! Biopics of tech geniuses!). Still, I admire and respect Tobey Maguire for stretching as an actor. He did much better than the material, and if the script and directing had been stronger, Maguire could have shown he is much more capable as an actor than he's given credit for. I look forward to his next move.